This time, the CBDT has notified the new ITR forms well in advance before the commencement of the tax filing season, providing an opportunity to tax payers to avoid last minute hassles in return filing. 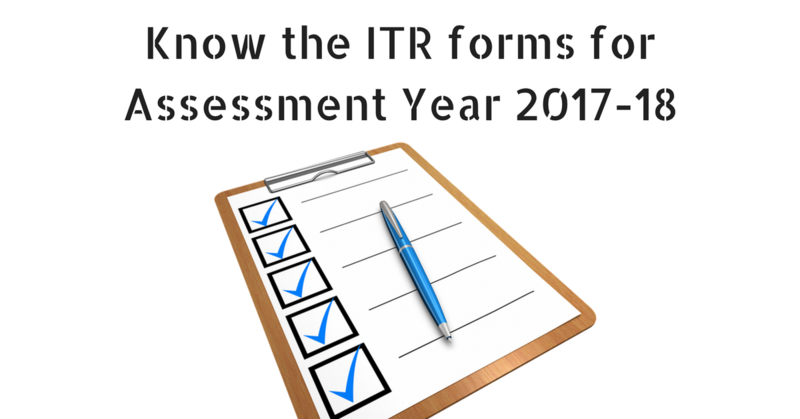 The new ITR forms for all categories of taxpayers for assessment year 2017-18 were notified vide Notification No. 21/2017 dated 30 March 2017. As a measure of rationalization, CBDT has reduced the number of ITR forms from the existing nine to seven. 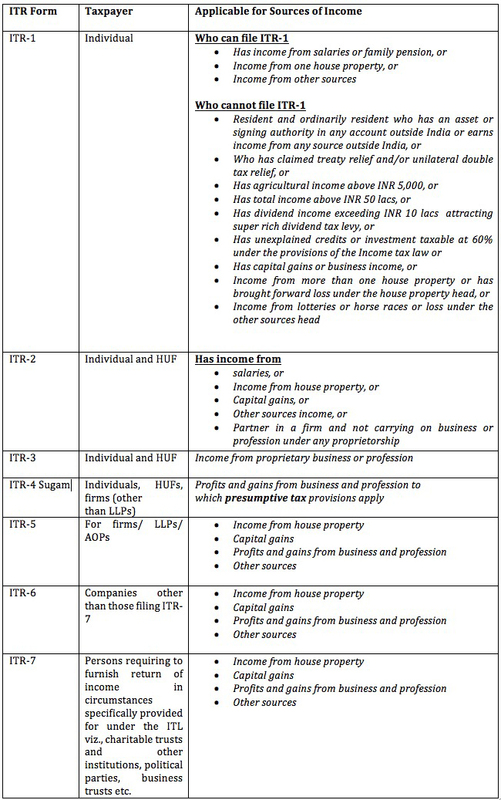 The following table explains the applicability of the ITR forms to various categories of taxpayers. 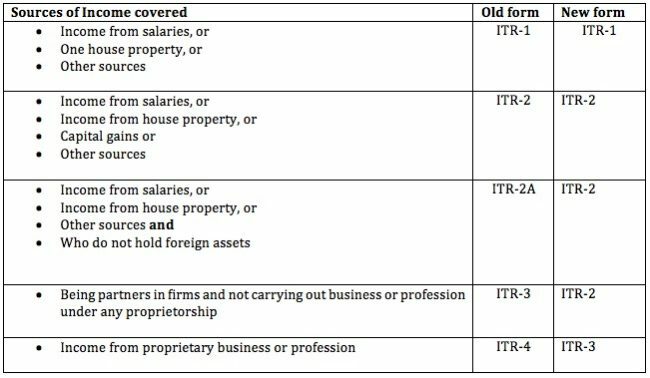 We have prepared a comparative table (named Table I) of the old and new ITR form applicable to individuals and HUF taxpayers which you may refer at the end of the article. Refer table II for a simplified understanding of forms. Let us now discuss the key changes made to the ITR forms. 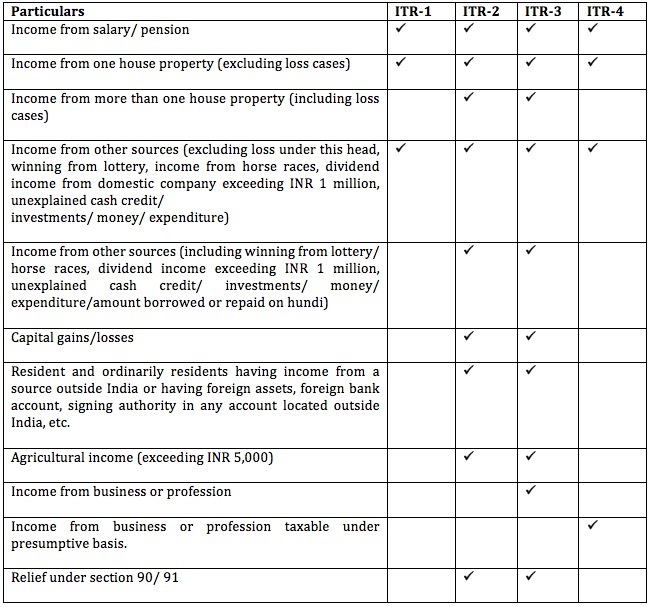 Simplified one page ITR-1 form applicable to individuals having taxable income up to INR 50 lacs. New ITR forms seek information of cash deposited in banks during the demonetization period viz., from 9 November 2016 to 30 December 2016, if aggregate cash deposits during the period was INR 2 lacs or above. The reporting requirement is applicable across all categories of taxpayers. Please note that, the threshold limit for reporting of cash deposit of INR 2 lacs as it appears is qua individual bank account and not on an aggregate basis across all bank accounts of the taxpayer. But, one may need to wait for instructions to provide further clarity on the issue. The ITR forms applicable to individual taxpayers have been amended to require mandatory quoting of AADHAAR. Furthermore, ITR-5 and ITR- 7 forms have also been amended to capture AADHAR details of all the partners of a firm/limited liability partnership (LLP) and of settlor, trustees and beneficiaries of a trust/institution etc. Please note that mandatory reporting of AADHAAR number statutorily comes into effect from 1 July 2017. However, it is not clear whether AADHAAR reporting is also mandatory where the taxpayer files ITR before 1 July 2017. Additionally, all the ITR forms also incorporate certain consequential modifications to give effect to the amendments made by the Finance Act, 2016 and Taxation Laws (Second Amendment) Act, 2016, which are effective from tax year 2016-17, such as reporting of details of dividend income exceeding INR 10 lacs liable to super rich dividend tax and details of unexplained credit or investment taxable at 60% plus applicable surcharge. The overall changes to the ITR forms seems to resulting in a simplified and rationalized version of the ITR forms or we can term them as “Aam Aadmi ka ITR form”. Reporting requirement as to disclosure of cash deposits during the demonetization period, will enable the Tax Authority to cross verify details against information collected from banks/post offices and take appropriate action in deserving cases. We suggest that while compiling details, one should also preserve relevant documentation or other proofs of source etc. in support of such deposits. This will help in responding to any questions raised by the tax authorities at a later stage. The linking of AADHAAR with PAN and invalidation of PAN where such linking is not done aims to minimize cases of tax evasion through duplicate/fake PANs. Having said that, making AADHAAR as a mandatory requirement to file a tax return in India is a significant change and will impact all those individuals who have tax filing obligation but are not having it as yet. Even though who have it, need to get it linked with their PAN. If by any chance, the details as per PAN are not matching with AADHAAR details, the same would need to get rectified immediately, to avoid inconvenience at a later stage. For expatriate employees this could be another compliance requirement to obtain an AADHAAR number. We hope that the cumulative effect of changes to the ITR forms is a higher compliance ratio. And as the saying goes, changes are welcome!! ← Your “Yes” to Cash means “No” to tax benefits!! !